I love tuna. It’s a wonderfully light fish with a distinctive flavor that works well in summer meals. 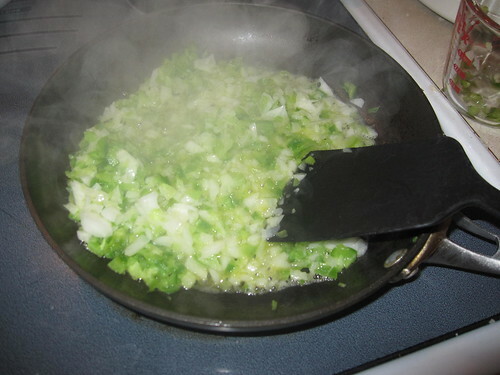 It’s also a component of a tuna noodle casserole that my mother used to make that remains one of my comfort foods. 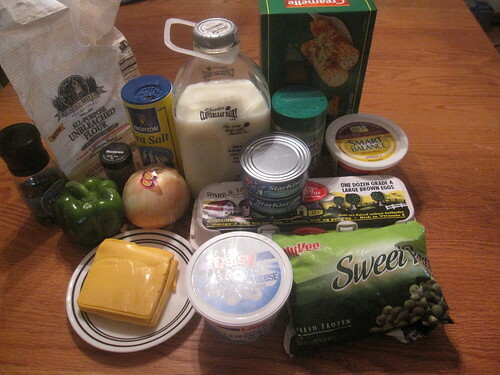 Our total cost for all of these ingredients was $9.62. Our end product served the four of us for dinner and for lunch the next day, bringing the cost per meal down to $1.20. 1. 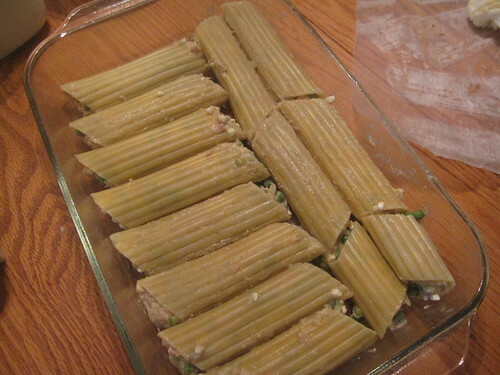 Cook the manicotti according to package directions, leaving you with some big pasta tubes to stuff. 4. 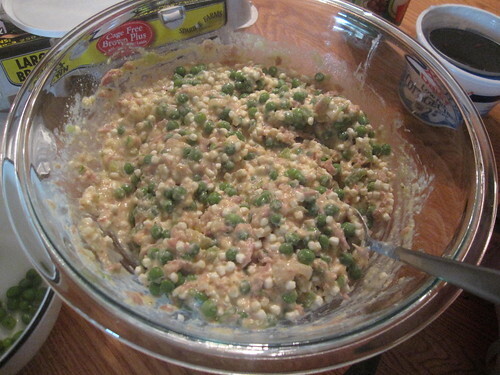 Mix together the eggs, cottage cheese, half of the Parmesan cheese, marjoram, the peppers and onions, the tuna, and the vegetables you choose to use (we used peas). Stir this up until it’s consistent. It’ll be moist but not watery. 5. 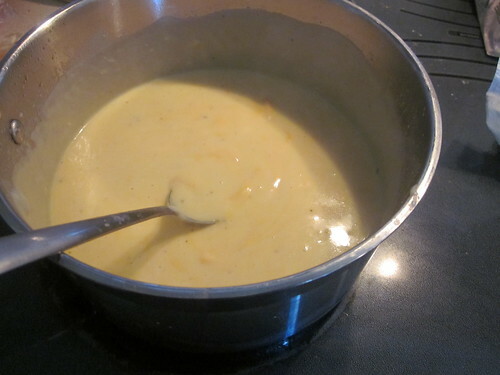 Stuff the manicotti shells with this mixture and lay them in a lightly greased 9″ by 13″ pan. You’ll have plenty to fill up each manicotti tube. 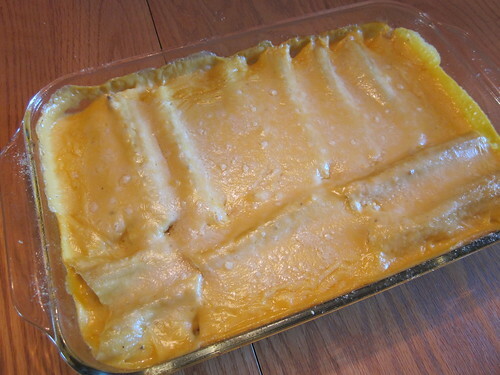 Once it’s melted, we just poured it over the manicotti, sprinkled the remaining Parmesan on top, covered the pan with aluminum foil, and stuck it in the oven for about 40 minutes at 350 F (180 C). We chose to serve it with a spinach salad and with a simple frozen fruit salad on the side. The fruit salad was really easy – we just mixed together some miscellaneous fruits we had laying around (quartered grapes, coconut, and some celery were the key ones) along with some peach-flavored yogurt. We poured this mixture into cupcake shells and froze them, popping them out just before the meal. It was a wonderful summery side. Our family loved this. 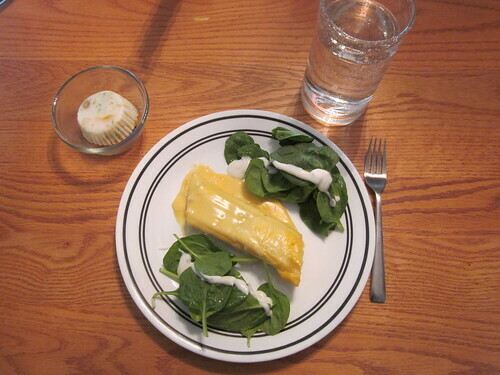 My four year old son actually ate more manicotti than I did (he ate one and a half pieces to my single one). When we pulled it out again to have for leftovers the next day, the kids actually started cheering (and I did, too – it was delicious). This is just all-around a wonderful dish – it’s priced right, is quite flavorful, and is easy to make (you can do all of it the night before, stick it in the fridge, and just bake it the next day if you want).